Sng Yong Meng is the Founder of ThePiano.SG, Singapore’s first piano portal and the only organisation that is building a community of piano lovers in Singapore. Since the incorporation of the company, Yong Meng has been actively delivering various initiatives and events and bringing the piano to a bigger segment of the community. Yong Meng has been playing the piano since he was 11 and teaching piano students since 2000. Over the years of his engagement with the piano and pianists, he had made several observations of the piano community. 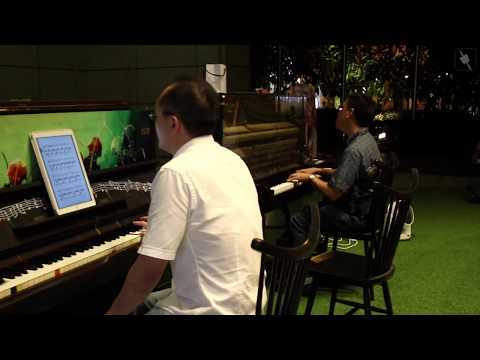 Not only did many piano students in Singapore not have many performing opportunities, most of them also learned the piano only to pass exams, rather than out of a genuine love for music. In addition, most parents were clueless about how to guide their children in the pursuit of piano education. Yong Meng also wanted to bring the piano to ordinary piano players, who may not otherwise have a platform to pursue their passion. In light of these observations and with a passion to serve the piano community, he took the first step forward to make a positive difference for everyone with ThePiano.SG in 2015. Yong Meng started a weekly Pianovers Meetup, an event held at Urban Park @ URA Centre that is open to the the public, and has provided a platform for ordinary piano lovers, known as Pianovers, who might not otherwise have had the opportunity to know like-minded piano enthusiasts, share their knowledge and experiences, build their own performing profiles, and showcase their talents. This outdoor event also doubles as an activity hub where people connect and bond and reinforce their relationship with one another. From a humble beginning in July 2016, the community has grown to almost 10,000 members now. To date, Yong Meng has hosted over 106 Pianovers Meetups. As a testament to the role that ThePiano.SG has played in connecting people in the piano community, Yong Meng and his activities have been featured and seen in (i) Singapore’s national daily The Straits Times, (ii) Challenge Magazine, the publication of the Public Service Division, Prime Minister’s Office, (iii) television news, Channel 5, Channel 8, and Channel NewsAsia, (iv) Zhonghua Primary School Annual, (v) Casio Music Circle Newsletter, and (vi) Tanjong Pagar Centre's online publication. Yong Meng has also collaborated with major piano companies like Steinway, Yamaha, Chiu Pianos and Casio. In addition, Yong Meng has also offered other piano-themed events, including Pianovers Sailaway, the first event of its kind in Singapore. Pianovers Sailaway was a four-hour evening cruise in a luxurious yacht with four pianos on board. Yong Meng has also conducted Pianovers Recital, a formal music event held in an auditorium, Pianovers Hours, a dinner event held in a restaurant incorporating a mini-recital with a baby grand piano, as well as Pianovers Schools, in which he brought the love and appreciation of music to a public school and spoke to the students during Assembly. Yong Meng has also been instrumental in bringing world-renowned personalities to Pianovers, including Adam Gyorgy, the Hungarian composer and pianist. In August 2017, Gyorgy visited Pianovers Meetup at The URA Centre, where he kindly graced an interview hosted by Yong Meng and had a group photograph taken with the Pianovers present. Apart from running events, Yong Meng also actively gives back to society. He started Pianovers Assist, a community programme which sees pre-owned pianos donated by kind owners and loaned to eligible piano lovers on rotation. Pianovers Assist is laudable for it gives piano lovers who are not able to afford a piano the chance to play on one. In early 2018, Yong Meng launched the Online Store, which offers Singapore’s largest collection of piano-themed products and gifts. Another initiative from Yong Meng is the Pianover Rewards Card, the only card in Singapore offering exclusive benefits and discounts for the purchases of pianos, piano-tuning services, piano-moving, as well as other piano-related services. To bring the piano even closer to the community, ThePiano.SG is now registered with People's Association as a Private Operator that offers courses and programmes at various Community Centres and Clubs (CCs), as well as Residents' Commitee (RC) Centres, around Singapore.